December | 2014 | Thomas Takes On…. I barely slept. I rolled around exhausted and as much as my body was exhausted, it would not allow me to sleep. Before I knew it, I was waking up at 1:30am waiting for the moment to get out of bed and to go and summit this mountain top that everybody keeps on telling me is so difficult that it is ridiculous. Way harder than the previous days…. I started ‘breakfast’ with a hot tea and a couple of sugar cookies and packed a hydralyte for the way. At 2:30am I started out with Chris up the hill. The others were way faster than us and so they were set to start out later and meet us. 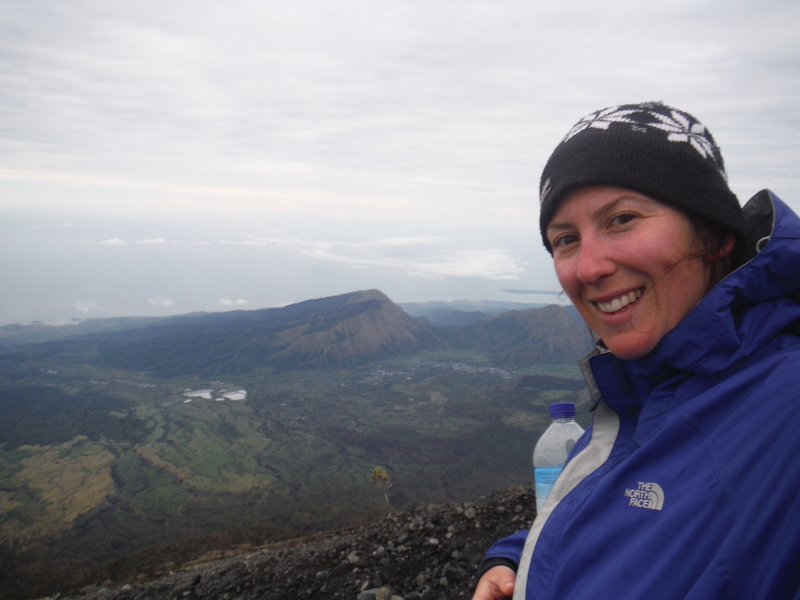 The first part of the trek was on a massive incline crawling over rocks and sandy scree to try and get to the crater rim. After about an hour, it was over and we were making our way along the crater rim at a more moderate incline. 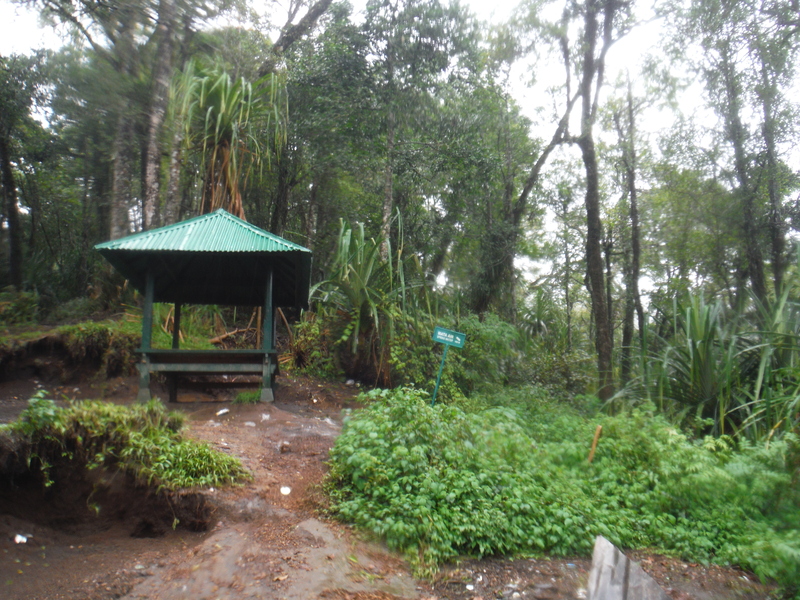 It was windy, it was dark and even though I couldn’t see much, I could see that the trail either side of me lead to a massive fall either down the outside of the volcano or into the crater. I tried not to think about it and kept on going. As I kept going all I could think to myself was the song ‘ants go marching one by one, hurrah, hurrah’ as I could see all of these tiny headlamp glows following one another up a hill like small ants. And then I saw it… Three French guys and an Aussie in shorts and a singlet at the top of the mountain in a man huddle to try and stay warm and I knew I was there! The view was incredible. Chris and I stood at the top and had a few pictures with the sign at the top over the view of the lake and at that moment I was so elated that something I had wanted to give up after one hour of walking on day one I managed to achieve through sheer will power and mind control. It was one of my greatest achievements. Yay! I made it to the top! The sun didn’t rise properly as there were too many clouds in the distance obscuring the sun. But I could see Gunung Anung on Bali, the Gili Islands, all the way across the northern coast of Lombok and Sumbawa where I was taking a boat trip in two days from that moment. The time up there was fleeting and never enough, but we gradually started to make our way down, taking pictures of all of the things that we didn’t see in the dark on the way up. 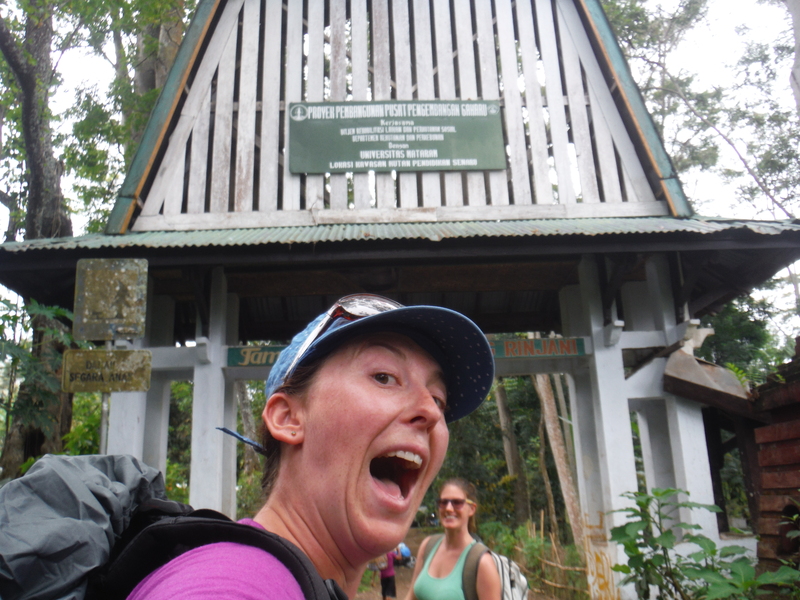 After a couple of hours we were back at camp, eating breakfast and packing up to start the trek back down to Sembulan. It was a steep descent. My knees, ankles and feet were killing me. But I kept on plodding along. After ten hours of walking that day, I managed to get out the end of the rice and farming fields to the road where the truck was waiting to take us back to Senaru. 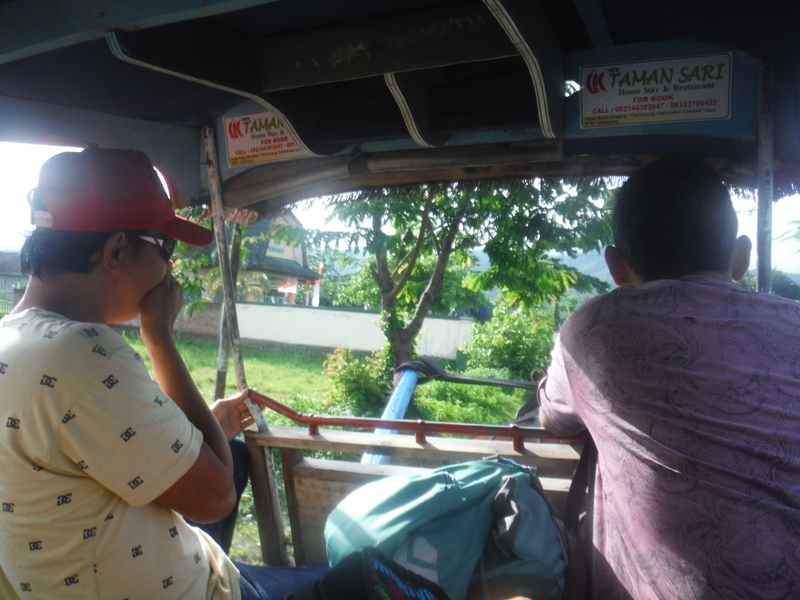 We sat in the back of the truck and waved to the kids through all of the villages screaming ‘Hello!’ at us along the way and eventually got to Senaru, picked up our luggage and headed to Senggigi where we were staying the night. The whole adventure at this point never felt like it actually happened. It felt like a dream…. except I had two giant swollen feet from the rapid change in altitude and a duck waddle when I walked for the next two days to remind me. This is something I laughed about despite my discomfort. 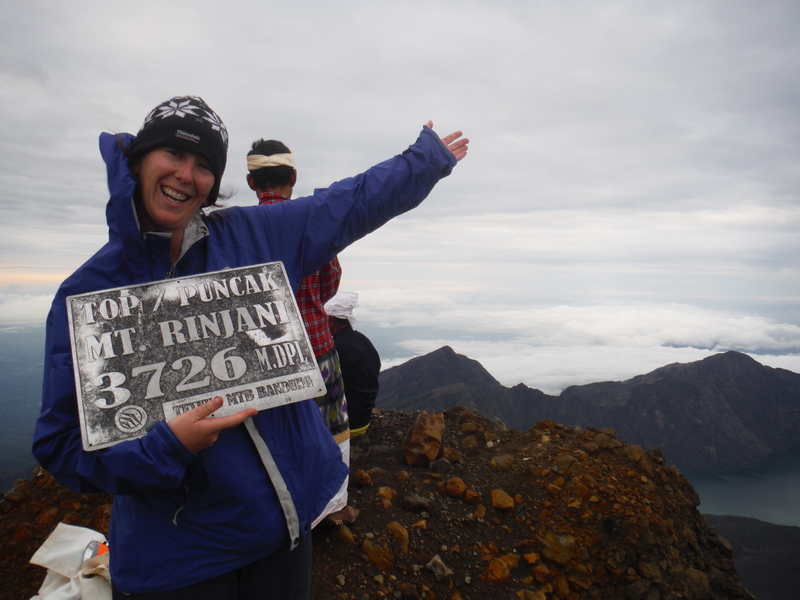 Because I took on Rinjani. And despite my own self doubt, I won! From 600m to 3726m in less than 48 hours. It was going to be one of the most challenging feats I had ever encountered. 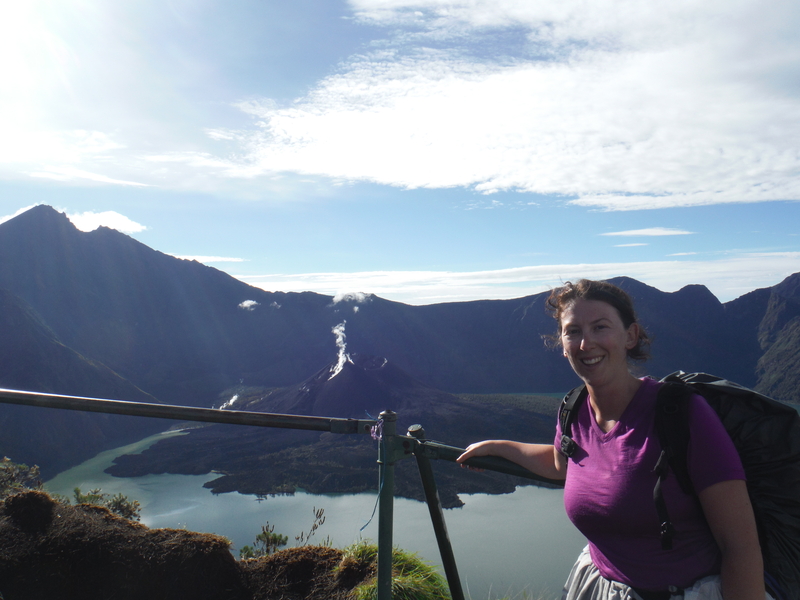 Welcome to Mount Rinjani, Indonesia! As I sat at the bar talking to a random guy in Gili Trawangan about trekking around the area and told him that I was going to hike Mount Rinjani he enlightens me that it is one hell of a tough trek. Forget the Annapurna Circuit and Everest Basecamp in Nepal, forget the tallest mountain in the region Kinabalu, Rinjani is way tougher. It is purely brutal. And so I started quaking in my pants worried about whether or not this is actually achievable. But the money was paid up and we were leaving in the morning so I was going to give it a decent go. 7am we headed down to the boat docks to try and find our boat. Confused about where we were supposed to be going, we eventually found our travel agent, Andy and he has shuffled us onto the local boat over to Bangsal. I sat at the end of the boat with my friend on one side and a local man asleep on my other shoulder for some unknown reason and we sailed on. As the only white people on the boat we were an easy spot for the men down the beach calling to us “Danni and Beccy!! Danni and Beccy! !” They helped us into a horse drawn carriage where we were taken to our breakfast point for our first meal of the day. From here it was two hours in a car driving to Senaru to begin the hike. We madly threw things into our bag so that we could get started with our porter as the rest of the group we were with had already begun walking two hours before us. As I started up the hill, it was brutally hot and quite steep. I remember thinking to myself in that first hour, if this is what the easy part is like, then kill me now because I will never make it. I was ready to throw in the towel, but at the same time I figured my body would become accustomed to it eventually and all I had to do was keep walking and to push through it. During the second hour I was really starting to feel the effects of not having had enough to eat before I started to hike and I am saying to my porter who doesn’t speak English the only thing I remembered in Indonesian from my market visit that I knew he had. “Pisang? Pisang? Terima Kasih! ?” I said to him and he shook his head at me knowingly and pulled out a couple of bananas for me to eat. I sighed relief and kept walking. Further relief came in the form of the torrential downpour of the wet season that could be trusted to begin at approximately 1pm every day. As the rain started teaming down, the trail became a river bed to walk up and the weather cooled down to the point where walking at this incline became more manageable for me. On the downside, my boots and a lot of what I owned had gotten wet, but that was bound to happen at some point anyway. Along the way we stopped at the rest points Pos I and Pos II and met some really cool people who imparted advice and gave us left over cookies that were to be pivotal to my quest later. Eventually we made it to the lunch spot and the rest of our group and munched down on some well needed and deserved noodles. And then it was time to continue. At the lunch spot we’re at 1500m above sea level. We started at 600m, we were camping at approximately 2400m, so we were about half way up in the incline stakes. And so the plodding, one foot after another kept on, and I kept on even though I was well further back from the group than the others due to my breathing limitations. Eventually we made it to the camping place for the first night. The porters had set up our tents in a line across the hill and we all got our drenched clothes off and attempted to get warm. My bag had gotten wet around the sides of my pack cover and my pyjamas had gotten wet also so I took to sleeping in a pair of rain pants…. funny I know considering I probably should have worn them in the rain. Dinner was quickly scoffed down and everybody retired to bed exhausted after a massive first day. The next day was to offer a bit of relief in the form of downhill, for which I was excited. We were told that it was to be a pretty hairy ordeal though with very slippery and steep rock faces. We weren’t to be disappointed. 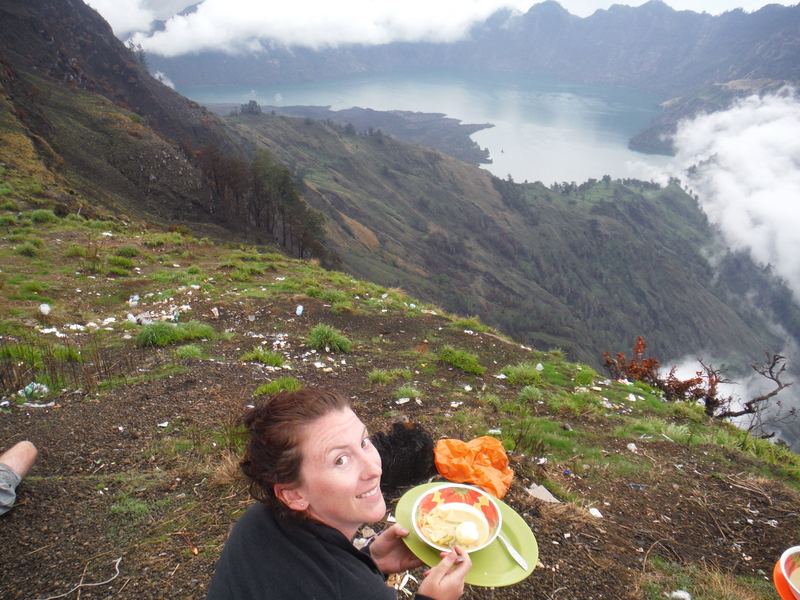 The day started with a 200m climb straight up from our camping spot to the crater rim where we glimpsed our first view over the incredible crater lake with Gunung Baru in the centre chuffing hot smoke. From here it was down into the crater to the edge of the lake over the aforementioned steep and rocky track before arriving at the bottom. I took my shoes off and had a bit of a paddle in the lake to cool down the feet before we moved on to our lunch spot and on to swimming in the hot springs. 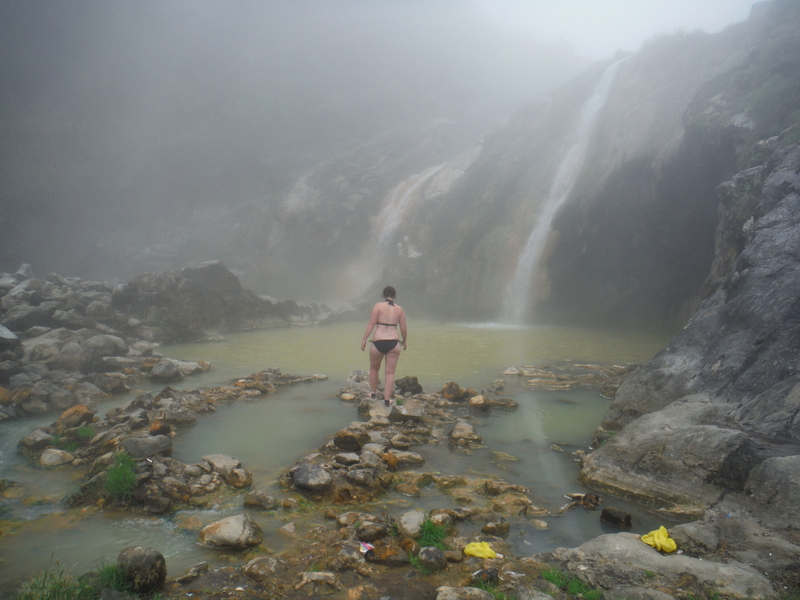 The hot springs were the most amazingly warm hot bath at that time ever and a Godsend for sore muscles. We sat in and among the hot waterfalls and relaxed for half an hour while lunch cooked and then it was time to eat. The saddest part about this whole area is the amount of trash lying around. The locals seem to have very little regard for the nature and very little understanding of the effects of pollution. It had drawn in a whole bunch of monkeys and flies around the area that were pests in trying to get at your food. One monkey waited until I wasn’t looking, came right up beside me and stole the chicken bone that I had set beside me when I was done with it. 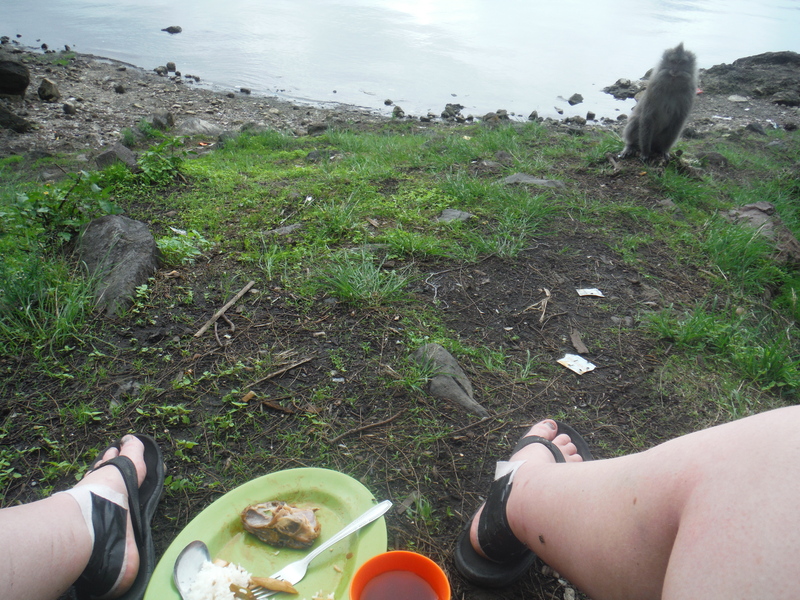 Another of the monkeys approached me while I had a chicken bone and was getting ready to charge me. I screamed and yelled at it, waving my arms about the place letting him know who’s boss for showing his teeth at me and charging at me. It is such a shame that it is getting this way. There is nothing that saddens me more than watching these monkeys ferret through left over plastic bags for food in a place that looks like a rubbish dump. And so from here we continued. Another brutal climb up sheer rock face for the next three hours to reach our camping spot for the evening. And while it was difficult, the rain held off just enough so that we could get there without too much swimming uphill into gushing water as we had heard happened to others doing this trek before us. We set up camp, we ate dinner, we prepared. Tomorrow was the big one. The summit. We were sitting at 2600m above sea level at the base camp for the summit. A gruelling 1100m ascent in 3 and a half hours that is to be climbed over volcanic ash and scree. 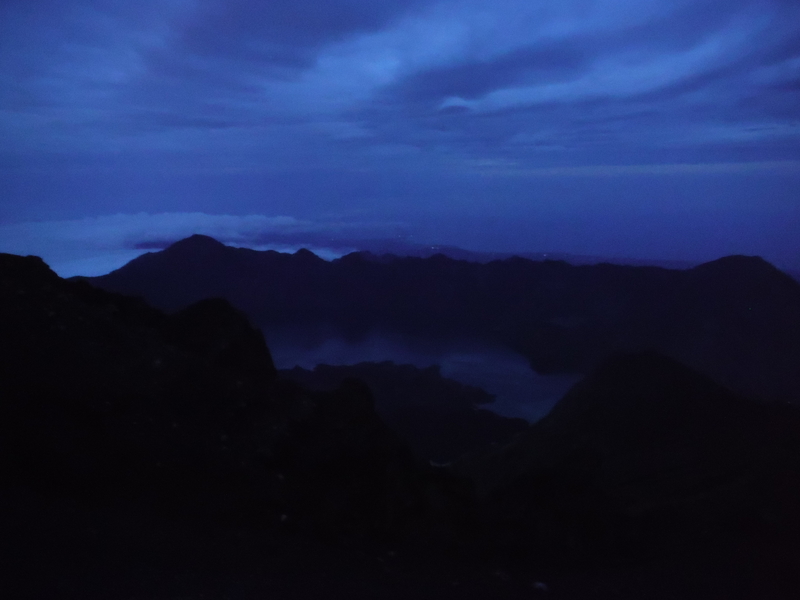 We were to be up at 2am to start the climb by 2:30am to get there for sunrise. For my summit climb and to see if I made it to the top, catch us next week! Ever since I have gotten to Indonesia I have been running flat out. It has been ten days and in that time I have sat on the Gili Islands, hiked the second largest mountain in Indonesia and taken a four day boat ride across the northern coast of Lombok and Sumbawa over to see the Komodo Dragons. While these are going to be huge stories to tell, I have not yet got the time to write about it as I am still running mad for the next week so hopefully there will be some awesome blog stories to fill you in with in coming weeks. However, I shall leave you with a few minor stories of ridiculous things that have happened this week. Some of the most random occurrences on this trip happened in the small town of Senggigi, Lombok. 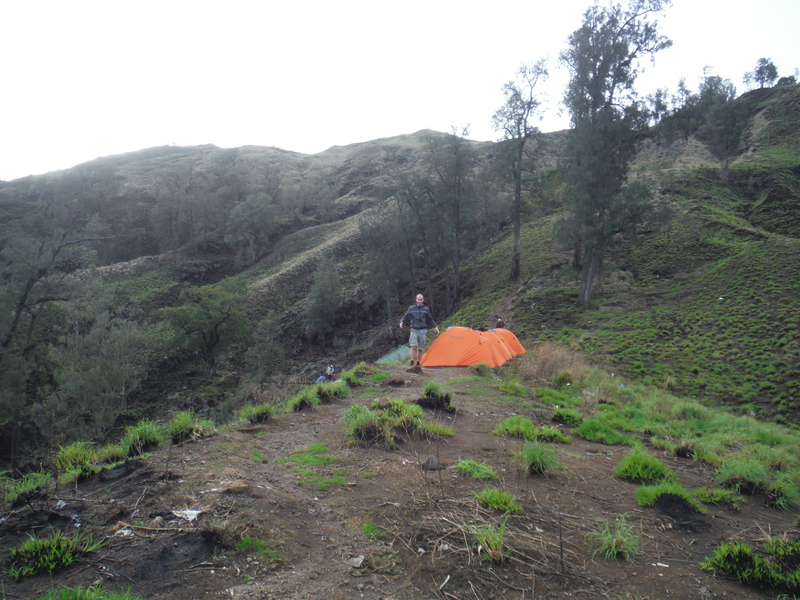 We were dropped here after our Mount Rinjani trek tired and weary. We decided firstly to have a walk around and see what was about the town and go and sit on the beach for a while. As we are walking along we were approached by a woman who asks us if she can have our help. Dubious about people stopping tourists to ask for help, we listened anyway. Turns out she was a school teacher in need of native English speakers to speak to her class for practice. So we agreed and went along to meet the kids on the beach. The first questions come out to Bec. “How are you? Do you have a boyfriend? How many boyfriends you have? Why you only have one?” Bec just laughed, told them she liked the one she has and palmed them off on me as I don’t have a boyfriend…. great. The kids had all kinds of questions “Where are you from? Do you like Senggigi beach? Do you like Lombok?” We answered patiently, signed our names a couple of dozen times to their notebooks, had even more pictures taken and then we left. It was a really fun experience. Only ten days out of teaching and already back to teaching and correcting people’s grammar! Hahaha! After the school kids and hobbling around further we were completely ruined. As such we decided that we should go and have the full works done. So Bec and I hobble over the road to the Orchid Spa (the one in town that is reputable and doesn’t give happy endings apparently) and ordered the works. Full body massage, scrub, body mask, manicure and pedicure. The ladies take us upstairs and lay us on a table each with no curtain between us pretty much stark naked except for these see through black underpants they gave us. Ummm….. OK then. We proceed to get massaged, Bec yelping every time they went over her knee area. Then the scrub stuff is applied and rubbed off of us until we are lying on a table full of flakes of salt and dead skin. Then comes the mask painted on with a brush, roll over and repeat. At the end of this process when we are all dry, we were ushered off into a shower to literally hose one another off naked together. Who knows how this would have went down if 1. I was a prude, or 2. I was alone. We pretty much giggled the entire time trying to get mask and scrub out of ears, belly buttons and any kind of crevice it could find to hide in. 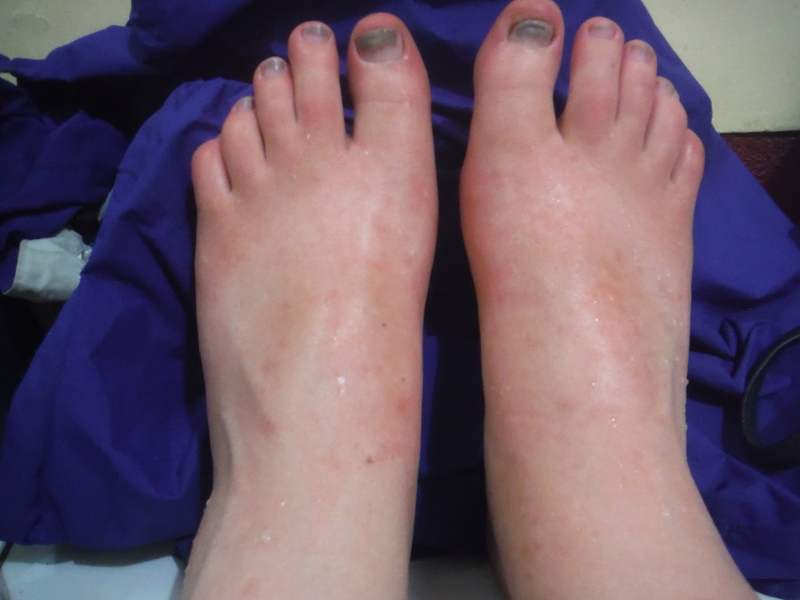 By this stage I was starting to not feel so good so I fell asleep whilst getting my nails done and woke up in a fever that sent me stumbling down the street at the locals saying “pharmacy, pharmacy”. It turns out that the day before I am due to get on the boat I am to get another bout of the tonsillitis that I had before I left…. it was going to be an interesting 4 days on the boat to come…. Boat trip and Mt Rinjani trip to come!!! “Micro-retirement: noun 1. the action or fact of leaving one’s job and ceasing to work for extended periods of time on multiple occasions throughout one’s working career.” – from the Danni Dictionary of Good Times. I was sitting at school one day in the staff room and one of the women there asks me whether I am back next year, to which I respond ‘no’. When she asks why, I inform her that next year I am going on what I term as ‘micro-retirement’ again. I am off to go and travel until the money runs out or I get antsy and need to stop and do some work for a little stability for a while. She sat across from me and said to me ‘I think this is amazing, and I am so glad that you choose to do this. You never know what will happen tomorrow’. She continued to tell me about how her and her husband had lead active lives and he used to run marathons, was healthy and fit as fiddle. They had spent their entire lives saving for a house, saving for kids, and then saving for their retirement to go and travel, see the world and enjoy their lives. After her husband retired, he went into hospital for a hip replacement from wearing it down through running triathlons. He had a complication in the week following and died of a blood clot post surgery. All of their savings and plans had gone to waste, because he was never going to see or do any of it. And now she doesn’t know how she is supposed to do it on her own. This to me was heartbreaking. I was almost in tears listening to her talk. Her loss was both abrupt and horrifying. And yet she sat across from me and said ‘You don’t know whether you will die tomorrow. So live like there is no tomorrow. Do what you want to do today if you can. You will never know what will happen, even if you are the fittest and healthiest you can be. You just never know’. Moments like these inspire me. I hear stories like these from so many people. In the blink of an eye, the plans are gone because their loved ones are gone. These moments remind me of why it is I choose this option of micro-retirements over the conventional decisions that others make. But in many cases micro-retirements can be quite a daunting thing to many. And so here are my tips to living adventurously and like there is no tomorrow by taking a micro-retirements as opposed to saving your whole life for one big retirement. Stability-schmility. There is plenty of money to be had if you are willing to work for it in this crazy world. Who would you be if you weren’t defined by what job you worked, what house you lived in, what stuff you owned and how many kids you had…. an interesting thought in this world that promotes capitalism and excessive need for stability. Some people shun me for being “a jack of all trades and master of none”. What I do know is that this particular skill has had me working in every field from science to education to promotions and marketing to forklift driving. As I say to my students all the time “don’t close doors on yourself. Do as much as you can and keep as many doors open as you can”. I am not super proud. To keep me on the road and fund my travels I have done everything from working as a cleaner, a manual labourer and one job I had was sticking promotions stickers on men’s toilet urinals. I have even sneakily collected recycling for bottle collection return. 4. OR choose a career that is supremely flexible. My current career as a teacher is greatly flexible. I can teach anywhere in the world and am flexible enough to teach a lot of different subjects. Other friends I have met that travel with their careers are nurses, accountants, scientists, trades people, people who work in hospitality and tourism. When you are on the road look for deals and do it the cheap way. If you have the time, take the local bus. Eat the cheap food off the street instead of from in the restaurant. Stay in smaller and cheaper guest houses. Think of the money you spend in terms of “how many nights accommodation” it is worth. And most of all ENJOY!! If you aren’t enjoying your life to the fullest, then what is it that you are doing? Time to take stock and try something different if what you are currently doing isn’t working!! Good luck!! And happy micro-retirements people!! !